This section brings up Switches and MAC addresses and how they work. Most people who only ever come in contact with smaller home networks do not actually have to learn about what a switch is or how MAC addresses work. The main reason is that almost any problem you could encounter in a home network is located on other levels of the network communication, often relating to IP addresses, routing, wireless or DNS. The switching, on the other hand, is often completely transparent to the user and doesn’t require any configuration in a normal home network. But for somebody who wants to learn more about computer networks, the information in this section is really one of the founding pillars of network communication. In any given office network you rarely find more than one or at most a couple of routers. You will however find switches all over the office environment. Switches are how client devices such as computers and printers are normally connected to a network. A router is packed with functionality and as such will always come at a higher cost per network interface compared to what a switch can offer. So if you want to connect a lot of devices to your network then a switch would be the best option. This holds true for a home network too of course. As soon as your home network grows big enough that you run out of available interfaces on the router, then the easiest way of adding more interfaces to your home network is to buy a switch and connect it to your home router. That way you also avoid duplicating the functionality of your existing home router. What many people don’t know is that the traffic that is sent over a network is always addressed with MAC addresses. IP addresses actually form another layer of addressing on top of the MAC addresses. So if you want to learn how computer networks function you obviously have to understand switches and MAC addresses, in addition to the IP communication that runs on top of the switching. We would like to remind you that Home Routers consist of several integrated parts, including a Switch. A lot of the pictures and examples in the Switching section showcase computers that are connected to a Home Router. 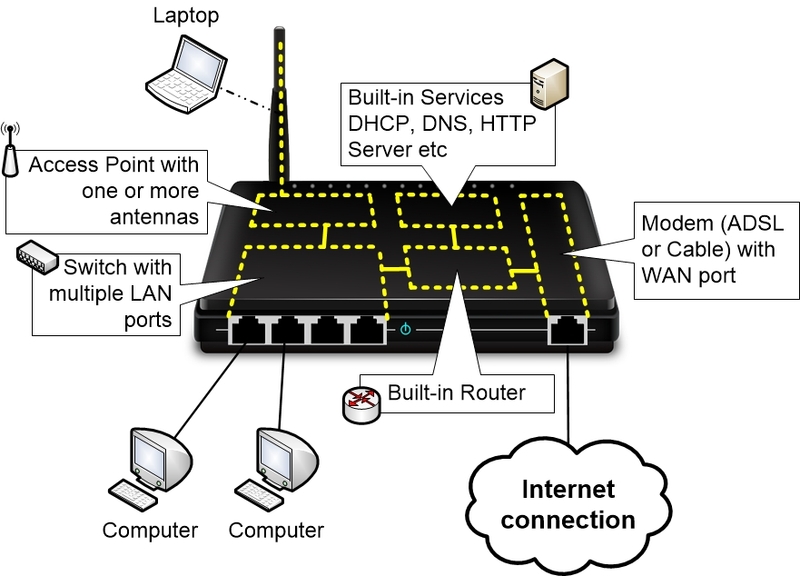 Have in mind that as long as the computers on the LAN network communicate directly with each other the traffic will not be handled by the integrated Router part of the Home Router. The traffic will instead be handled only by the integrated Switch. Switching is the task that is performed by Switches in a network. Whereas Routers are forwarding network traffic based on IP addresses, switches instead forward network traffic based on something called MAC addresses. The subject of Switching contains a wide scope of information, and most people who start to learn about computer networks think that Switching is the easiest part to learn, since “it just works”. You connect a couple of computers to a switch and they can then immediately communicate with each other. No configuration required! So most people assume that the Switch and the tasks it performs must be really simple. The truth is that a switch and the theory behind switching is rather complex. If you want to understand what switching actually is and what a switch really does, then you need to acquire a lot of basic knowledge about how network communication works. For that reason, the section about Switching is divided into several subsections. We encourage you to go through the sections in the intended order of presentation unless you already know the contents of one or several sections.